When you hear of people holidaying in Croatia you’d expect to hear that they’re jetting off to Dubrovnik or Split, but more and more airlines are now flying to Pula the largest city in the region of Istria – which happens to be the closest airport to our Croatian campsites making it perfect for a fly and drive holiday. As a stunning seafront city with incredible historic buildings, it’s easy to see why this city is quickly becoming a tourist hot spot. If you’re flying into Pula we highly recommend taking a little wander around and hitting these top spots. 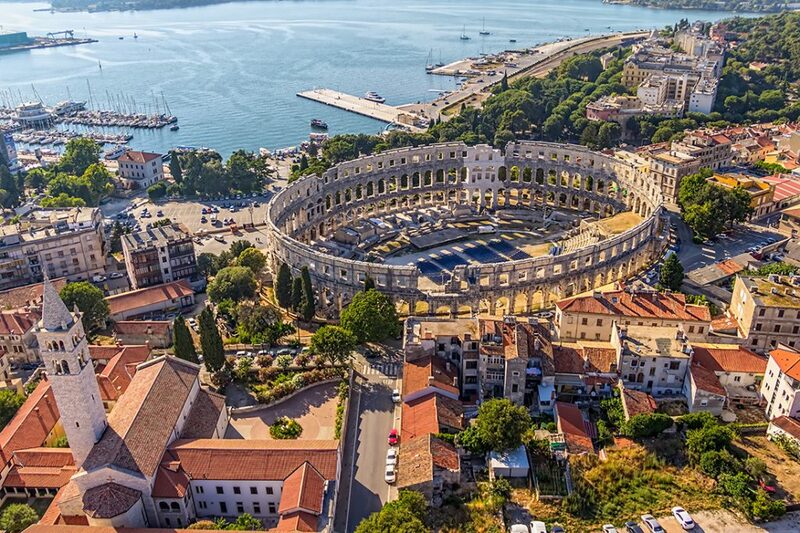 Back in the day Pula was pretty important due to its strategic location, it ended up being occupied, destroyed and rebuilt a number of times by the Romans, Ostrogoths, Venetians and the Allied Forces during World War II. This city is so rich in history which is clear from the beautiful architecture visible from every spot around the city. Most notable is the incredible Roman Pula Arena, an impressive colosseum that has been around since the 1st Century and is still used for events to this day. 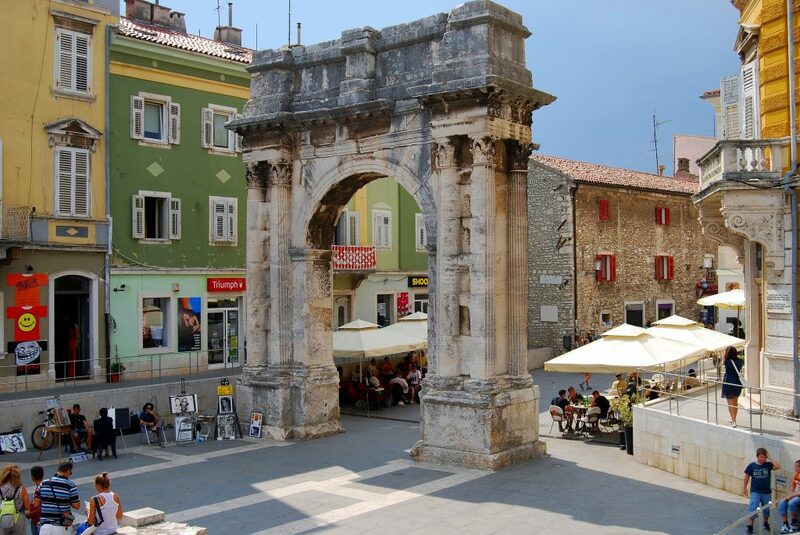 You can easily spend an entire day in Pula seeing the sights from the Arch of the Sergii a triumphal arch dating as far back as 29 B.C. to the Pula Cathedral from the 5th Century. There is also a stunning star-shaped castle that houses a historical museum. A sight to wow the kids would be the Brijuni National Park, located on a group of islands off the shore of Pula, which has actual dinosaur footprints alongside Roman ruins and a golf course. One of the most interesting of Pula’s historic sites is the underground tunnels of the city known as Zerostrasse. They were built during World War I to provide shelter from the city’s people during air raids. The tunnel is about 400 meters long and consists of shelters, trenches, galleries and passages. The tunnels were very carefully built, all connecting in the centre and each entrance provides regular air flow maintaining temperatures between 14 and 18 Celsius all year long. One part of the tunnel is still used today for holding cultural events such as exhibitions. It is certainly one of the most unique aspects of Pula and something you won’t see elsewhere. 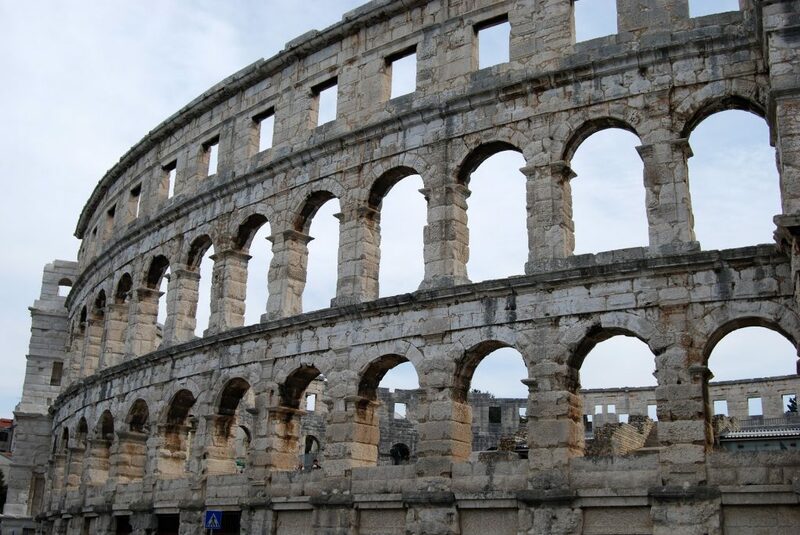 Alongside the sites, there is plenty to do in Pula. Being on the shore, Pula has a number of beautiful beaches perfect for a sunny day. A lot of Pula’s beaches are stones or pebbles with just small sections of sand but Ambrela beach is completely sandy with very easy access to the sea it is the most ideal for families with children. Flanaticka Street is a vibrant street that leads to the Arch of the Sergii and is packed full of shops and restaurants. A little tip just for the adults… make sure to treat yourself to the wine while you’re in Pula. Croatia is not very well known for its wine since it does not produce a lot of it but the quality it does produce is said to be on par with that of its neighbour Italy – a claim we’d certainly like to investigate! Pula’s newest attraction is the best way to round off the day. You won’t have seen anything like Pula’s night time illumination show called the ‘Lighting Giants’. Designed by Dean Skira, the show is a spectacular light display of 16,000 different colour combinations lighting up the cranes of the Uljanik Shipyard. The show takes place every evening from dusk until 10pm and during the summer until midnight – it is definitely not to be missed. So what are you waiting for? Get booking those flights to Pula and check out our best campsites in the Istria region.